Blevins, Juliette. A Long Lost Sister of Proto-Austronesian? Proto-Ongan, Mother of Jarawa and Onge of the Andaman Islands. Oceanic Linguistics. 2007, 46 (1): 154–198. Man, E.H. 1883. On the Aboriginal Inhabitants of the Andaman Islands. The Journal of the Anthropological Institute of Great Britain and Ireland, Vol. 12. Manoharan, S. 1997. “Pronominal Prefixes and Formative Affixes in Andamanese Language.” Anvita Abbi (ed.). The Languages of Tribal and Indigenous Peoples of India. The Ethnic Space. Delhi: Motilal Benarsidass. Zide, Norman Herbert & V. Pandya. 1989. "A Bibliographical Introduction to Andamanese Linguistics." Journal of the American Oriental Society 109: 639-51. ^ Appendix in Man, Edward Horace. On the aboriginal inhabitants of the Andaman Islands. London: Royal Anthropological Institute. 1885. ^ Radcliffe-Brown, A. R. (1922). The Andaman Islanders: A study in social anthropology. Cambridge: Cambridge University Press. ^ Burenhult, Niclas (1996). "Deep linguistic prehistory with particular reference to Andamanese." Working Papers 45, 5–24. Lund University: Department of Linguistics (PDF). [2010-06-26]. （原始内容 (PDF)存档于2005-04-25）. ^ Abbi, Anvita and Bidisha Som (2007). "Where Have All The Speakers Gone? 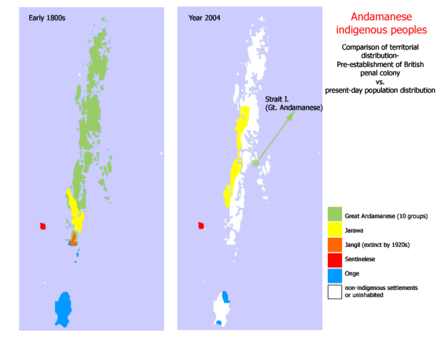 A Sociolinguistic Study of The Great Andamanese", Indian Linguistics 68.3–4:325–343. ^ Temple, Richard C. (1902). A Grammar of the Andamanese Languages, being Chapter IV of Part I of the Census Report on the Andaman and Nicobar Islands. Superintendent's Printing Press: Port Blair. ^ Manoharan, S. (1983). "Subgrouping Andamanese group of languages." International Journal of Dravidian Linguistics XII(1): 82–95. ^ Wurm, S.A. (1977: 929). New Guinea Area Languages and Language Study, Volume 1: Papuan Languages and the New Guinea Linguistic Scene. Pacific Linguistics, Research School of Pacific and Asian Studies, Australian National University, Canberra.